A positive mind leads to a positive life. That’s why I try to spend the first few moments of my day thinking positive thoughts. This habit sets me up to have a good attitude which almost always leads to a good day. Mantras are a great way to set your positive intentions. If you don’t know what a mantra is it’s basically a pep talk that you use to ignite change in yourself. By reaffirming your mantras every morning you remind yourself of your goals and worth. Once you begin to train your thoughts it becomes a lot easier to redirect them when they become negative. Planting happy seeds in your thoughts can make not just your day better but your life better. That is why I wanted to share my personal 10 mantras with you all. I hope you can use these as motivation to come up with your own daily mantras. Mantra #1 : My worth is not dictated by others. I can find value in simply being myself. This one is important to me because it is so easy to get caught up in the negative comments on social media. This is my reminder that it doesn’t matter what others think of me, it only matters what I think of me. Mantra #2: It gets better. I say this mantra because a lot of times we can get wrapped in a moment and it feels like the end of the world. But there is always something better coming and hard times are necessary so that we can fully appreciate the good times. Mantra #3: Keep your heart open. In life and in relationships its easy to become closed off to other people because of past relationships that have caused pain. I am constantly reminding myself to keep my heart open and not allow my past to effect my future in a negative way. Mantra #4: Just Keep Swimming. Now yes this is from Finding Nemo however, it is a necessary mantra for life. I tell myself this one a lot especially when I feel like I just keep messing up. I have to remind myself that everyone makes mistakes and that I just have to keep trying. Mantra #5: Accept the things you can not change and change the things you can. There are things in life that we can not change and sometimes I focus too much on those things. I try to remind myself that those are things I can not change and that I should spend my energy on the things that I can change because otherwise I am just wasting my energy. Mantra #6: Never stop learning. As humans we can never stop learning, there is always something new to be discovered and I always try to be as willing to understand as possible. I love nothing more than learning new things and when I wake up in the morning I remind myself to be open. 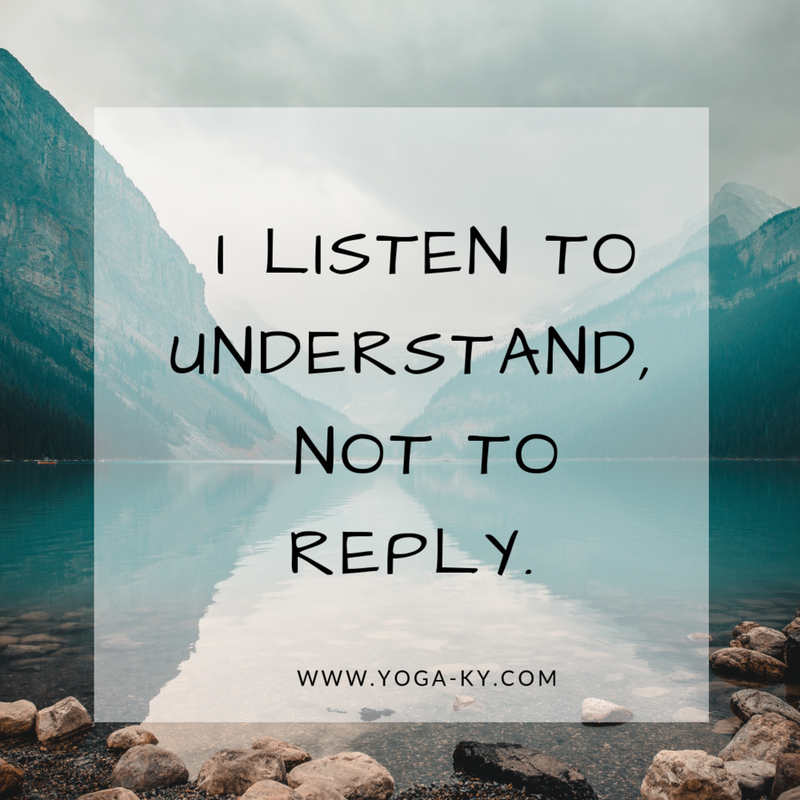 Mantra #7: I listen to understand, not to reply. I like this mantra because it reminds me to be more present and understanding of others. I believe it is just as important to listen and try to understand things from other peoples point of view. I believe this helps me to avoid conflict with others and remain positive and healthy in my beliefs. Mantra #8: Be grateful, always. Always be grateful for what you have. I can not stress this one enough, there is always someone out there who has it a million times worse than you do. So just be grateful for your life, thankful for what you have been blessed with and grateful for the opportunity to live your own life and make it completely your own. I remind myself of this one because I love smiling at strangers and I love when strangers smile at me. I feel like its such a simple way to spread positivity to others and when you receive a smile back it gives this warm feeling in your belly that you only know if you’ve smiled at strangers before. It can also me a source of sunshine to a stranger that might be having a gloomy day. As a teacher I strongly believe that there is power in giving back to others, sharing the gifts you are given and spreading them around. Whether its a free yoga class or feeding a stray kitty. I try to volunteer and give back not only because it benefits those who need it but because it keeps your soul humble. Most importantly just be happy, no one has ever been who you are and no one ever will be you again so try your best and just smile! What are your daily mantras? Comment Below!